Well this is very interesting, and very scarey, to say the least! It’s not bad enough that pet treats imported from China have sickened so many of our beloved pets, but now the very chicken we humans consume on a daily basis may also be coming from China? Keep in mind, while reading the article below, that this same imported chicken could also be used in your pet’s food. Why wouldn’t it be?…it’s already approved for human use! Genuine General Tso’s chicken may soon be on the plate. The Department of Agriculture will allow Chinese poultry processing companies to ship fully cooked, frozen and refrigerated chicken to the United States. Food safety advocates have been predicting the announcement since the department last year approved the export of chicken raised in the United States to be processed in China. But shipping chicken to China for processing and then shipping it back here has proved uneconomical, and no American poultry firm has done so. 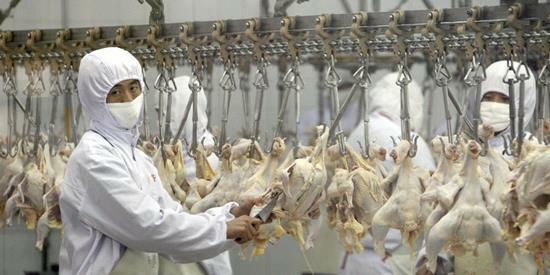 Earlier this year, a major meat supplier to McDonald’s got caught up in a food scandal after a Chinese television station broadcast video showing workers in its Shanghai plant doctoring labels on chicken and beef products and scooping up meat that had fallen on the ground and putting it back on conveyor belts for processing. The country has also had frequent outbreaks of deadly avian influenza, and the Food and Drug Administration attributed the deaths of more than 500 dogs and some cats to chicken jerky treats from China. School lunch advocates have been especially worried about Chinese chicken potentially ending up on trays. Nancy Huehnergarth, a nutrition policy consultant, has noted that processed chicken does not require country of origin labeling and predicted that it would end up in chicken nuggets and chicken soup. According to the Congressional Research Service, China has wanted its chicken to be accepted as a quid pro quo for lifting a ban it imposed on United States beef products in 2003 after a cow in Washington state was found to have mad cow disease.